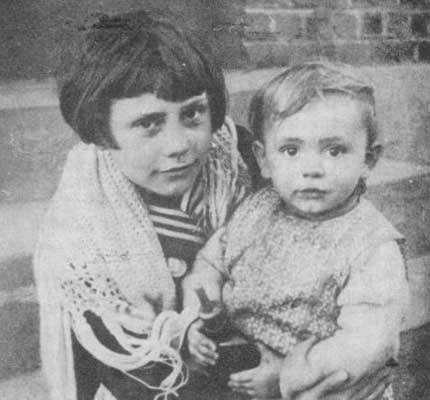 In a garden behind the Beco family's cottage, the Blessed Mother is said to have appeared to Mariette Beco (age 11) eight times. Calling herself the "Virgin of the Poor," Mary promised to intercede for the poor, the sick and the suffering. 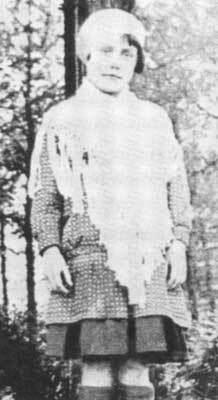 Mariette Beco was born the eldest of a family of seven children in a Catholic working family, who, however, did not practice their religion. She dwelt in a house isolated on the plateau of the Ardennes, along the route of Pepinster. Her household was not a pious one. Her father Julian Beco was an unemployed wiremaker who hadn't been to Mass in many years and her mother Louise was not very devout either. Because of her family circumstances, for two months Mariette had not gone to church, she was doing very poorly in catechism class, and she had stopped going to her instructions for Holy Communion. The apparitions of the "The Virgin with the Golden Heart" to the five children of Beauraing, Belgium which is 50 miles to the northeast away from the poor farm village of Banneux-Notre Dame. Mariette saw something out her window but thought it was a perhaps reflection of her oil lamp. She moved the lamp to another room and looked harder. 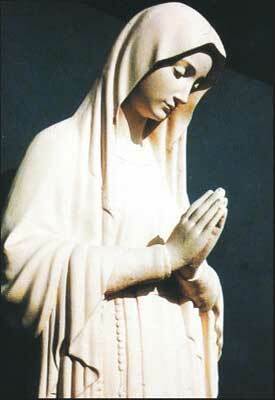 Mariette sees through the window of her house a beautiful and luminous lady with a Rosary in her hands . She wore a long white gown with a blue sash and was barefoot in the snow but did not appear cold. She called her mother who caught a faint glimpse of something, but told her she was crazy, locked the door and forbade the girl to look at the vision. At school the next day, Mariette and a friend go to see the parish priest Fr Louis Jamin who dismisses her as trying to copy the Beauraing apparitions. 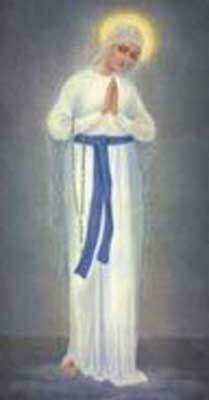 For the next two days the Virgin did not appear again but Mariette became pious and restarted her catechism. She learned her lessons perfectly and this surprised Fr Jamin who encouraged her to pray to Our Lady for guidance. At 7:00 pm, Mariette ran around to her back yard and fell to her knees in silent prayer. Her father thought this was a strange sight and came out to see what was going on. Mariette saw a birght ball of light increasing in size and passing through the pine trees and finally changed into a "woman's silhouette". The Virgin appeared a yard away from her on a "luminous cloud". Her father and 2 neighbors had gathered to see if they could see anything. Mariette said loudly and with a clear voice: "She is calling me!" The girl rose and ran in the direction of the main road, very fast, as if carried by the wind. Suddenly, Mariette stopped in her tracks and fell to her knees twice, near a spring. Our Lady said: "Put your hands in the water! This fountain is reserved for Me. Goodnight. Good bye." The Virgin disappeared a few seconds later - her silhouette became a ball of light and faded away in the horizon. Around 10:00 pm, Father Jamin went to the Beco's house. He was surprised by Julian's account of the story and his declaration to convert, make a general confession and go to Mass. At the same time the next day as Mariette prays the Rosary with 17 people around her, The Virgin appears for the third time. When Mariette asks her identity she says "I am the Virgin of the Poor." They then went to the spring together. Mary declared: "This spring is reserved for all the nations, to bring comfort to the sick." Just before leaving in a ball of light, she said: "I will pray for you; good bye." The next day around 6:45 pm, the fourth apparition took place with thirteen witnesses, including Father Jamin and the first two journalists. 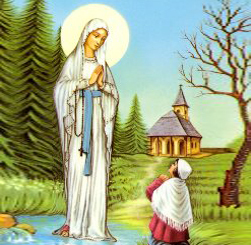 During this apparition, the Virgin made a request: “I would like a small chapel.” Our Lady imposed her hands on Mariette and traced the sign of the cross over her head. At the end, Mariette lost consciousness. However, during the following days until February 11, the apparitions stopped. Some made fun of Mariette, calling her "Saint Bernadette." Despite the intense cold, Mariette continued praying and believed that she would see the Virgin of the Poor again. 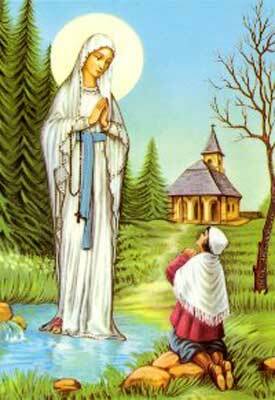 On the anniversary of the Apparitions in Lourdes at 7 pm, The Virgin appears for the fifth time. Mariette ran with incredible speed to the spring after the Lady, dropped to her knees and dipped the tip of her rosary in the water. "I come to alleviate sufferings," Mary said to her interiorly. The following day, Mariette received First Communion from Fr. Jamin. The Virgin appears for the sixth time while Mariette prays the Rosary with her mother and friends. Mariette asks for a sign but is only encouraged to "Believe in me and I will believe in you. Pray very much. Goodbye." The Virgin appears for the seventh time and encourages her saying: "My dear child, pray, pray very much." The Virgin appears for the eighth and final time. "I am the Mother of the Saviour, the Mother of God. Pray very much. " Then she imposed her hands on Mariette's head and blessed her with the sign of the cross. She said, “Adieu – till we meet in God.” And Mariette cried as she understood this would be her final appearance to her. 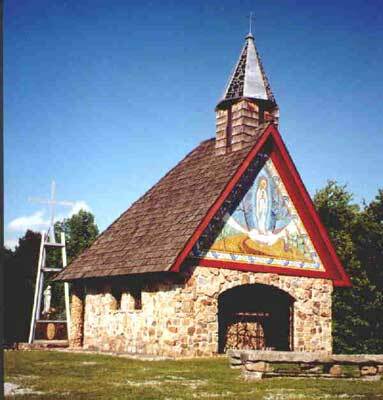 The Little Chapel was built and inaugurated. Investigations by an Episcopal commission begin headed by Msgr Leroux, director of the diocesan major seminary. Seventy three people testified under oath. The commission's work was finished. The whole file (428 pages and 21 documents annex) was transmitted by the diocese of Liege to the archbishop of Brussels-Mechlin, then to Rome. The Holy Office had in effect given to these bishops the liberty to "judge these extraordinary events." Msgr. Kerkhofs, bishop of Liege, immediately lifted the restrictions, and promulgated full and entire authorization for practicing the "cult" which to that point had been simply tolerated. Bishop Msgr. Louis-Joseph Kerkhofs of Liege approves the cult of the Virgin of the Poor. Cardinal Van Roy, primate of Belgium, intervened to exclude all the apparitions which had abounded in Belgium, except Beauraing and Banneux, which were being examined by their respective bishops (Namur and Liege). 20 meeting sessions were convened for the members of the new committee to make a pronouncement on the character of Mariette Beco and on the supernatural origin of the apparitions. Some evoked the "hysterical disposition" of the seer. Other talked about a deception or illusion. 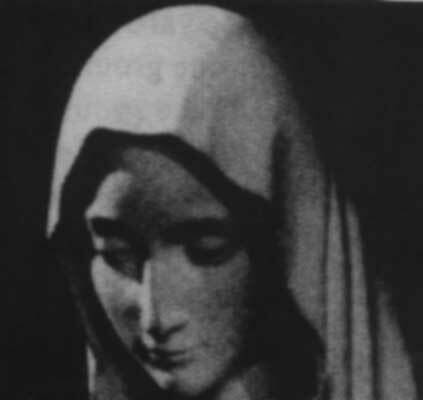 According to them Mariette imagined that she saw the Virgin Mary after having read a flier about Lourdes (conserved in the library of the patronage in Banneux). Last meeting of the commitee. The apparitions were viewed with doubt: "The events of Banneux appear to be neither certain nor even probable"
Msgr Kerkhofs, with the help of Father Rene Rutten (1878-1948) ordered a third and last investigation committee. This time, the conclusions were positive and the supernatural origin officially recognized by the bishop of Liege, on August 22, 1949, sixteen years after the events. The apparitions receive preliminary approval. The apparitions are recognized by the Vatican. Msgr E. Forni, the Apostolic Nuncio to Brussels, solemnly crowned the statue of the Virgin of the Poor. Pope John Paul II went to Banneux and had an audience with Mariette at the sacristy. The Vatican issues a letter to the Bishop of Liege to commemorate the 50th anniversary of the apparitions. Cardinal Godfried Danneels, archbishop of Mechelen-Brussels and special envoy named by Pope Benedict XVI, accompanied on his mission by Fathers Karl Gatzweiler and Joseph Bodeson, members of the cathedral chapter of Liege, Belgium to celebrations marking the 75th anniversary of the apparitions of the Virgin of the Poor. 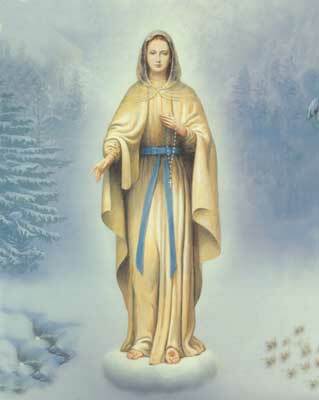 The Virgin was enveloped in a "great oval light" and wore a long white gown with a sash of "unforgettable blue" and a white, tranparent veil covering her head and shoulders. Her right foot was visible and "crowned with a golden rose" between the toes. She had a rosary on her right arm with diamond-like beads and a golden chain and cross. She stood on a cloud with her head and shoulders bent sllightly to the left. Calling herself the "Virgin of the Poor," Mary promised to intercede for the poor, the sick and the suffering in her eight messages. Additionally, Mariette Beco had reportedly received a secret which never was made public. Click here to read the messages of Banneaux. Many people, including Mariette's father, were converted to Catholicism upon hearing accounts of the apparition. Five hundred thousand pilgrims visit the site of the apparitions every year. Over fifty miraculous cures have been documented at the spring. Banneux was investigated from 1935 until 1937 by an Episcopal commission, after which the evidence collected was submitted to Rome. Meanwhile growing numbers of pilgrims came to the shrine, and on March 19th, 1942 Bishop Mgr. Louis-Joseph Kerkhofs of Liege approved the cult of the Virgin of the Poor. 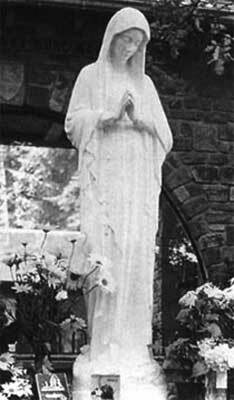 In 1947 the apparitions themselves received preliminary approval, with this becoming definite on August 22, 1949. 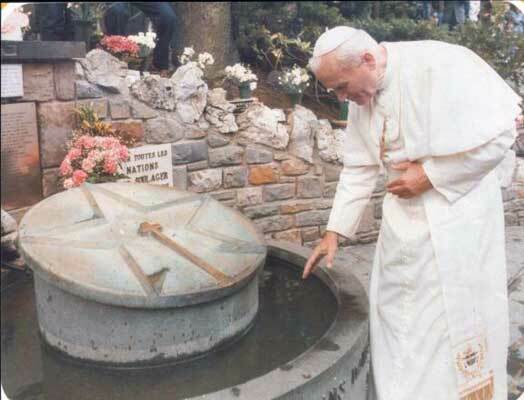 In 1985, Pope John Paul II went to Banneux and had an audience with Mariette at the sacristy. On July 31, 1999, the Vatican issued a letter to the Bishop of Liege to commemorate the 50th anniversary of the apparitions. Click here to read official Church statements on Banneux. The Feast of Our Lady of Banneux is observed on May 31st. lead us to Jesus, the Source of Grace. Fountain of Grace, sanctify us. we shall pray very much. May you ever be blessed ! And blessed be He who deigned to send you to us. What you have been and are to us now, you will always be to those who, like us, and better then us, offer their faith and their prayer. You will be all for us, as you revealed yourself at Banneux : Mediatrix of all graces, the Mother of theSaviour, Mother of God. A compassionate and powerfull Mother who loves the poor and all Peaople, who alleviates suffering, who saves individuals and all humanity, Queen and Mother of all Nations, who came to lead all those who allow themselves to be guided by you, to Jesus the true and only Source of eternal life. Our Lady of Banneux, Mother of Our Saviour, Mother of God, Virgin of the Poor, since thou hast promised to believe in us if we believe in thee, I put all my trust in thee. Deign to listen to the prayers that thou hast asked be addressed to thee; have pity on all our spiritual and temporal miseries. Restore to sinners the treasure of Faith, and give to the poor their daily bread. Deign to relieve suffering, to heal the sick and to pray for us, so that thus through thy intercession, the reign of Christ the King may extend over all nations. Beevers, John. Virgin of the poor: the apparitions of Our Lady at Banneux. St. Meinrad, Indiana: Abbey Press, 1972. Connor, Edward. Recent apparitions of Our Lady. Fresno, California: Academy Guild Press, 1960. Piron, Paul. Five children: the story of the apparition of the Blessed Virgin at Beauraing. New York: Benziger, 1938. Wuillaume, Banneux: a message for our time, Banneux, 1995.